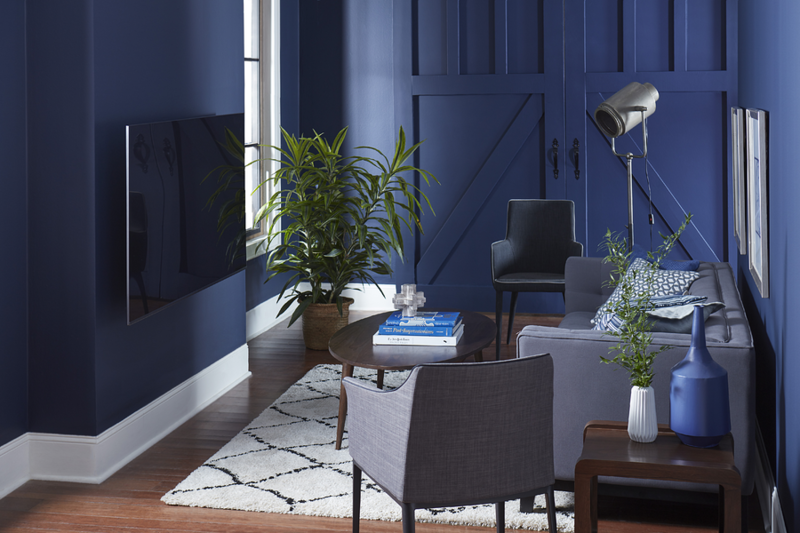 If you’ve been on Pinterest at all lately, you know that dark walls are in. Nothing can transform a room quicker or cheaper than a few coats of paint, but anyone who’s spent the better part of a Saturday painstakingly applying painters tape and working a roller knows that this isn’t a task you want to revisit anytime soon. #PinterestFails are much more manageable when you’re left with a cake that didn’t turn out, not when you’re left hoping “bat cave chic” becomes a thing. Being happy with the finished product really comes down to two things: finding the right paint color and painting the right room. Now, there are a lot of rooms in the home that could work well – the bedroom and bathroom come to mind, but we’re going to focus on one area that looks particularly great in a dark coat of paint: the living room. 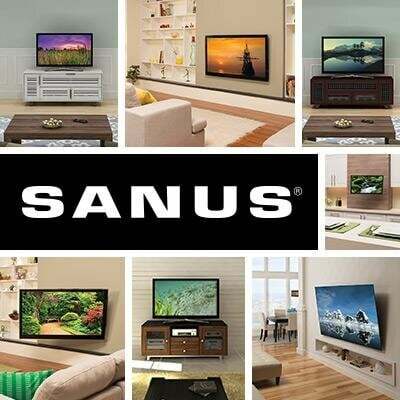 Specifically, your living room TV wall. Why? TVs often unintentionally become the focal point of the room – chances are your sofa is placed directly in front of it. 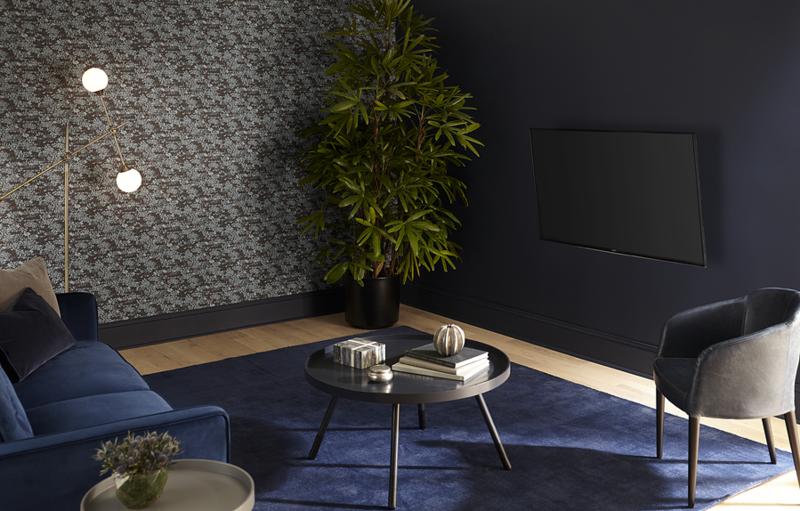 If you are looking for a way to downplay the role your TV plays in your décor, a dark wall can virtually make your TV disappear into the wall. At the same time, it adds a touch of drama whether you opt to paint only a dark accent wall behind your TV or paint the entire room a dark hue. What's the Best Paint Color for Behind the TV? 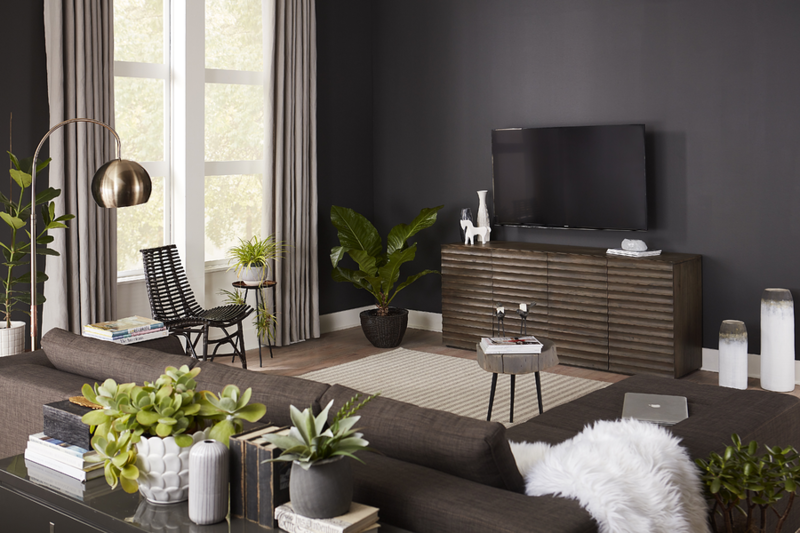 Finding the best color for the wall behind your TV is largely a matter of personal preference, but there are a few considerations: If you’re thinking about going all-in with a black TV wall, know that black absorbs all light, so it won’t give you the range of tones when light hits like other non-black colors would. Shades like deep navy, dark jewel tones and really dark greys are all great near-black options. Dark wall paints, especially grey tones, have a tendency to dry lighter than expected. To address this, you may want to go a shade or two darker to get your desired color. A good way to test how paint will appear is to swatch your walls with paint samples and view them at different points of the day as the natural light changes. As expected, the directions your windows face will also impact how your wall color reads. If you have north-facing windows, your wall color will naturally look cooler and deeper than if you had south-facing windows. If your windows face east, your wall color will appear warmer and brighter in the morning and turn bluer later in the day and vice versa for west-facing windows. To get extra impact from your paint color in a dark room, use an eggshell finish (halfway between satin and matte) instead of a flat finish. It will reflect some light and give your walls a small amount of sheen. An added bonus is eggshell finishes are easy to clean. Can I Do a Dark Wall Color in a Small Space? There has been a lot of debate on this topic, but it seems in more recent years, the experts are in agreement that dark walls can in fact make small rooms look larger. This is because dark colors visually recede, tricking the eyes into thinking the walls are further away than they actually are. So if you have a small living room, dark wall colors are still an option for you. If your small room also has low ceilings, paint the trim the same color as the wall. This will hide the trim and make the walls appear taller. Traditional: If you prefer traditional over contemporary styles, choose natural finish or painted wooden furniture over plastic or metal pieces. The traditional look of wood balances out the modern vibe of bold paint, keeping the overall appearance warm and classic, rather than sleek and modern. Go Bright: Inky-colored walls work particularly well with bold-colored accessories that provide a pop of contrast. They also keep the color scheme from feeling overly stark or serious. Keep It Neutral: Dark walls also look equally great when styled with pared-back neutrals. If you’re going the neutral route, try incorporating textures such as velvet, faux fur, wool, leather or linen. The added textural elements will help add visual interest and depth to the room. 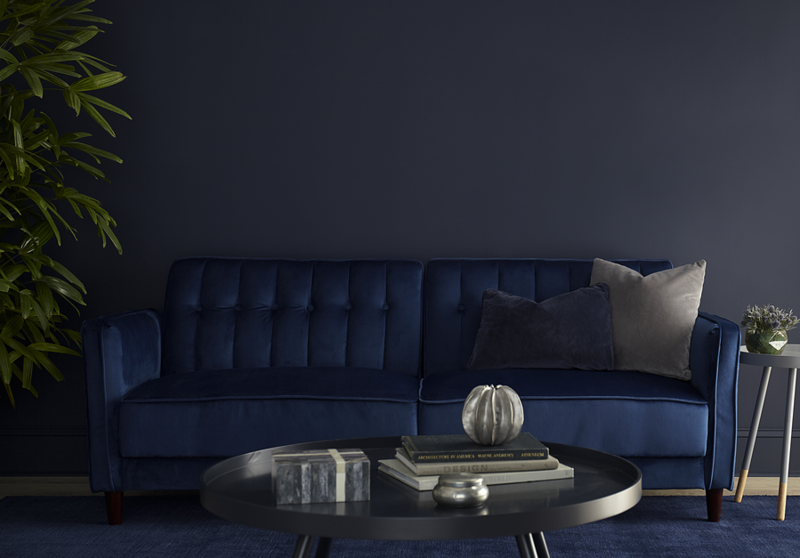 Tone-on-tone: The tonal play of matching your wall color to your sofa to even your rug is huge right now. It may not be for everyone, but it is a look that offers a truly dramatic payoff. Touches of White: The high-contrast look of white accessories on a dark background can look especially striking. Artwork or a gallery wall will especially pop when set against a dark wall. Hints of Metal: Metallic elements like brass, copper, rose gold or chrome play beautifully with a dark backdrop. A few carefully chosen metallic pieces can transform a dark room. Plant Play: As shown in the images above, plants look great against a dark wall. The fiddle leaf fig has been a long-time favorite houseplant. If you’re looking for something a little different, the glossy rubber tree and zee zee plant, and the oh-so-lush (and tall) bird of paradise are great alternatives. Don’t Forget Your Outlets: One last tip when it comes to the finishing touches: don’t let outlets and light switches become an unintended focal point. Swap out all visible outlets and switches with dark-finish switches and cover plates. This type of project provides a great opportunity to mount your TV. Moving your TV off of your furniture and mounting it to the wall will give your living room an aesthetic upgrade - and even save you some space. When wall mounted, your TV will further disappear into your newly dark walls, and give you the option to get rid of older media furniture that may not fit your current vibe. If you’re on the fence as to whether getting a new entertainment center or mounting your TV is the best route, check out this post weighing the pros and cons of both TV mounts and entertainment centers.